Combine the coconut milk, spanspek and fruit juice in a blender and blend until smooth. Sweeten with honey, to taste. 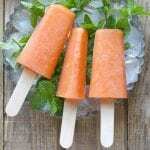 Pour into ice pop moulds and freeze until firm.